It would be difficult to better our introduction to Pacific sailing. The sun came out the morning we sailed from Seattle, and apart from a few hours darkness each night, it has stayed out ever since. The Pacific high is well and truly established over the top of us giving us cloudless conditions, azure blue skies, calm seas, and at times even a little wind as an afternoon sea breeze fills in. 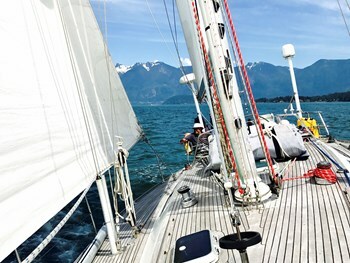 The first few days saw us sail out from Puget Sound into the San Juan Islands. Once fiercely disputed between Britain and the United States because of their strategic position, they are now an idyllic sailing paradise. There cannot be many cruising areas in the world that offer such a wealth of wild anchorages in such a compact area. You could cruise the area for a fortnight without visiting the same anchorage twice and never having to sail more than a handful of miles each day. From the San Juan Islands we headed to the Gulf islands off the SE corner of Vancouver Island before crossing the Straits of Georgia to sail into Vancouver. When it comes to spectacular approaches from seaward, Vancouver ranks right up there with Rio and Cape Town. The skyscrapers of downtown Vancouver set against the backdrop of the snow capped Rockies make for an unforgettable experience when approaching on a clear day. Whilst our first 10 days have been breathtakingly beautiful, We keep on getting told by the locals that "things will only get better as you go north" - in which case we are in for a truly memorable time over the next couple of months.